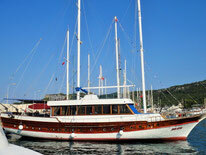 Standard Gulet or what we called a 3 Star Gulet have good comfort. Crew members are well trained to serve you on the 3 star level. All cabins are non air-conditioned and have standard requirement for basic needs. Good and safe Gulets for active groups, at which the group experience, is more important than the comfort. Standardized cabins, each with Bath/WC. Good Turkish kitchen, pleasant and comfortable decks. Ships for 6 - 20 people. In this type of charters, it is rather difficult to give the names of the yachts in advance as the bookings on these cruises are open until the departure day. The yachts are allocated according to the latest booking status with the right room breakdown.Your yacht could be one of yachts listed below ! A separate living area designed for the crew... A comfortable living room and fully equipped kitchen... Apart from your personal belongings, it is recommended to bring a snorkel and pallets to dive and hand and face and bath towels and also a beach towel with, so that you may feel yourself more comfortable. The length of our all yachts varies between 18 and 25 meters and number of the cabins in our yachts varies between 4 and 10 double bed cabins. There is a WC/Shower in each cabin of our yachts. There are music sets, wireless, GSM phones and lifeboat in our each yacht. Our schooners, which are exaggerated, comfortable and suitable for marine, have a sunbathing area on the front deck and offer siesta pleasure on the rear deck... A separate living area designed for the crew... A comfortable living room and fully equipped kitchen... Apart from your personal belongings, it is recommended to bring a snorkel and pallets to dive and hand and face and bath towels and also a beach towel with, so that you may feel yourself more comfortable. The length of our all yachts varies between 18 and 25 meters and number of the cabins in our yachts varies between 4 and 10 double bed cabins. There is a WC/Shower in each cabin of our yachts. There are music sets, wireless, GSM phones and lifeboat in our each yacht.